This study reports on an efficient microscale one-way valve system that combines the physical properties of photopolymerized microstructures and viscoelastic microchannels to rectify flows with low Reynolds numbers. The comb-shaped moving plug in the microchannel prevented backflow in the closed state to ensure that the microchannel remained completely blocked in the closed state, but allowed forward flow in the open state. This microfluidic check valve was microfabricated using the combination of the soft lithography and the releasing methods with the use of a double photoresist layer to create microchannels and free-moving comb-shaped microstructures, respectively. As a result, the microfluidic check valves elicited average high-pressure differences as much as 10.75 kPa between the backward and forward flows at low Reynolds numbers of the order of 0.253, thus demonstrating efficient rectification of microfluids. 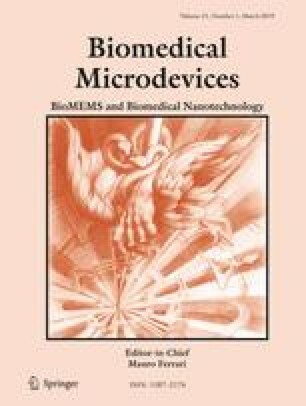 This study supports the use of rectification systems for the development of biomedical devices, such as drug delivery, micropumps, and lab-on-a-chip, by allowing unidirectional flow. This work was supported by the National Research Foundation of Korea (NRF) grant funded by Korean Ministry of Education (Grant No. NRF- 2018R1D1A1B07051411).